Abojet® Cartridges | Abatron, Inc. Uses: Restore monolithic integrity to cracked structural elements by injecting an epoxy compound into cracked to fill and “weld” it back together. Seals foundations and below grade walls against water seepage. The Abojet series of resins is most commonly used in the restoration of load-bearing walls such as foundations, retaining walls, abutments, swimming pools, dams, decks, silos, bridge piers, columns, domes, concrete pipes, and tanks. Features and Benefits: Since Abojet bonds permanently and is stronger than concrete, the “welded” wall can be stronger than the original. It is the perfect solution where structural requirements cannot be compromised and a dependable cost-effective alternative to demolition. The Abojet Crack Injection Process: The Abojet system consists of a resin and hardener packages in a single cartridge. When the barrier separating them is plunged, they begin to harden. Injected into a crack or cavity, it hardens within minutes or longer depending on temperature. The hardened system is dimensionally stable and virtually shrink-free. Each 10 fluid ounce cartridge fills 18 cubic inches; nozzles included. Q I have a basement wall, standard "cinder block". Hairline cracks in the mortar due to settling. Is Abojet a good alternative to tuck pointing? No. 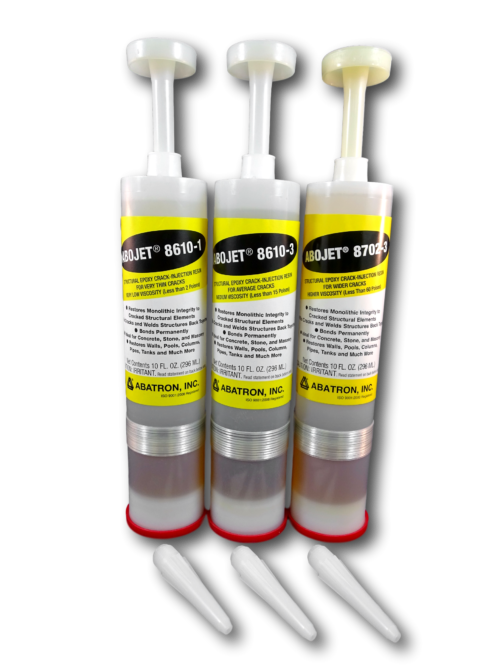 Abojet is structural wall crack injection product. Q Could this product be used on a large monument, i.e. grave monument? It is made up of several levels. The base is of cast concrete, where areas are crumbling away allowing the entry of moisture. It is from the 1880's. The Abojet is a structrual crack injection product. The Aboweld 55-1 may be a better product for your project. Q Is a special "gun" needed to push the material out? You can use a standard caulking gun. Q i have a fire place with flat stone fascia around the mantle. stones are falling off, drag, and the job is a year old. can i use this product as a glue? can I squeeze it in between the stone to lock them together? like a grout? This is a liquid so it cannot be used as a grout. Aboweld 55-1 can be used to re-attach the stones. Q What are the tensile and compressive strengths of these epoxies? Also, do you make injectable polyurethane structural foam? Tensile strength: 5000-11,000 psi; Flexural strength: 5000-13,000 psi; Compressive strength: 8000-16,000 psi. We do not make foams.